I felt like a summer image today. This is from this past summer while I was up in Minnesota. 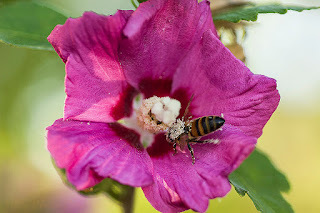 There is a large group of Hollyhocks that grow in this spot and the bees just love them. This is a Honey Bee just full of pollen from visiting the blooms.